The Engineering and Design industry in India wants the graduating engineers to be industry ready. Some of the qualities needed in the fresh engineers joining the engineering and design workforce include analytical mind, problem solving, exploratory mind, application of knowledge in real life industry, and learning ability. In short, the industry needs versatility- people with general engineering skills and exposure to domain knowledge. At present these needs are not addressed. To address the above twin challenges of building the talent pipeline with core engineering skills as well as applied special skills, the leaders from the Engineering industry have come together to pool in their expertise on the various subjects and to develop a curriculum that will augment the overall engineering skills to address these challenges. NASSCOM's Engineering forum, known as Engineering Proficiency Council, consists of 27 different companies that are focussed on diverse Engineering and Design verticals such as Telecom, Automobile, Aerospace, and Technology, to pool in their expertise. They have developed the curricula framework that could be implemented in the academic institutions and by the Third Party Training Providers. The objective of the initiative is to build scale in the skilling effort and collectively address the industry challenges and build capabilities for India as a country to meet the growing demand. The EPC is chaired by Mr. Manjunath Hebbar, Vice President for Strategies at HCL Technologies and co-chaired by Dr. Sandhya Chintala from Sector Skill Council, NASSCOOM. The EPC has proposed building an alternate curriculum, Engineering Proficiency Program, which will consists of Foundation Skills comprising of Professional Skills as well as an appreciation to integrated product engineering concepts. 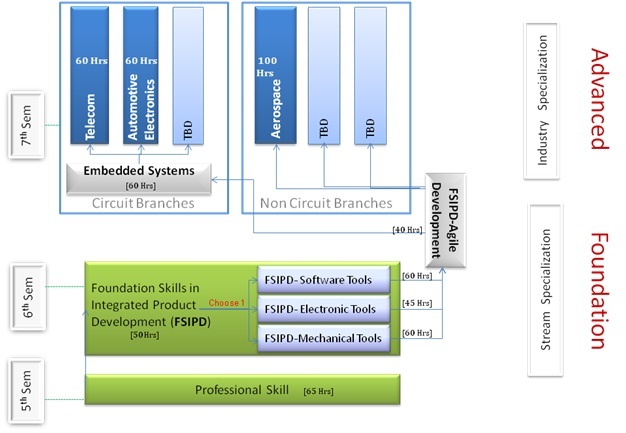 EPP will also include Advanced Programs, like Automotive Electronics, Aerostructures, and Embedded Systems.